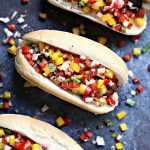 These Grilled Bacon-Wrapped Beer Brats with Drunken Peppers and Onions combine all of your favourite food in one delicious recipe. Fire up that grill and enjoy an epic dinner. 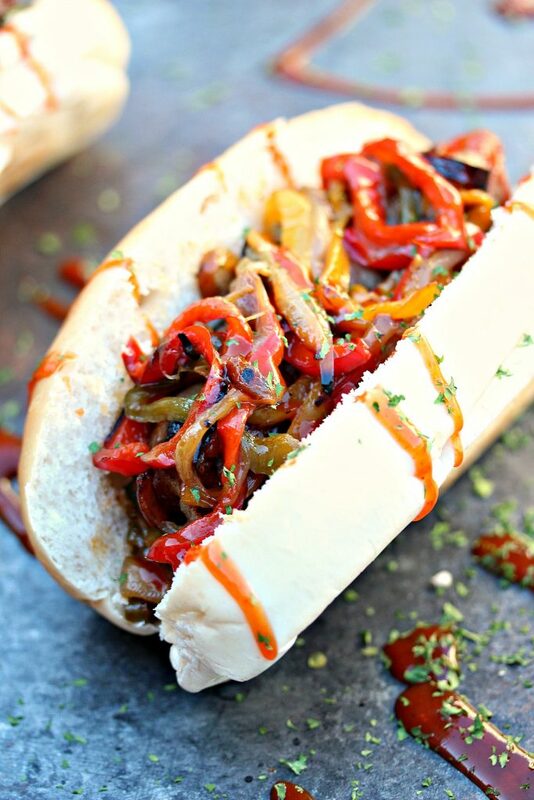 Click here to PIN these Grilled Bacon-Wrapped Beer Brats with Drunken Peppers and Onions! This is a sponsored post for Johnsonville. All opinions are my own. Thanks to all the companies, and readers, who help support Cravings of a Lunatic. I’m obsessed with sausages this summer. To be fair, I’m obsessed with them every summer. If I’m being completely honest I’m obsessed with them year round. 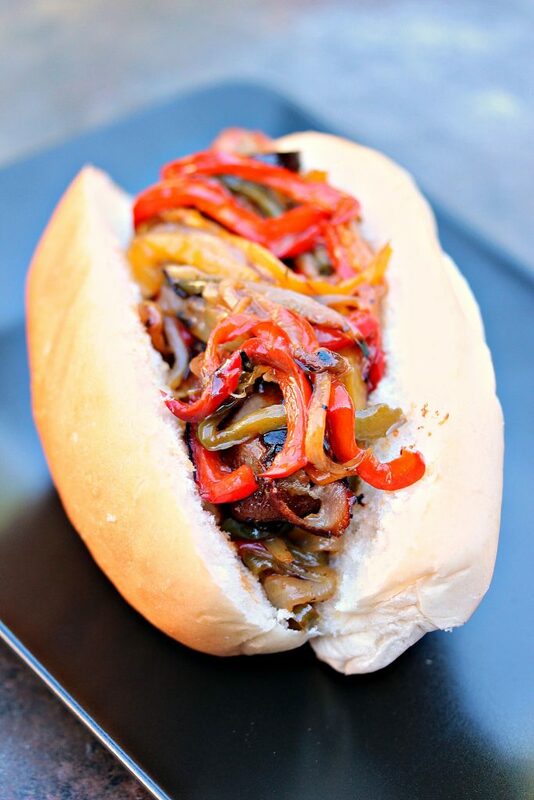 There’s something about combining sausages with peppers and onions that just makes me monumentally happy. All the flavours compliment each other perfectly. Nothing beats Bratwurst cooked on the grill, then topped with fresh ingredients. Nothing. This recipe packs a punch in the best possible way. Your friends and family will flip out over it. For anyone who is obsessed with Brats like my family is, you must know the best kind involve beer. I used Beer Brats for this recipe. Then I used more beer for cooking the vegetables. It’s just how I roll. Johnsonville makes the best Beer Brats in the world. They just have so much flavour and make your favourite grilling recipes pop. Quality is important when grilling. I trust Johnsonville implicitly. This grilling season we’re celebrating a new holiday called Bratsgiving. 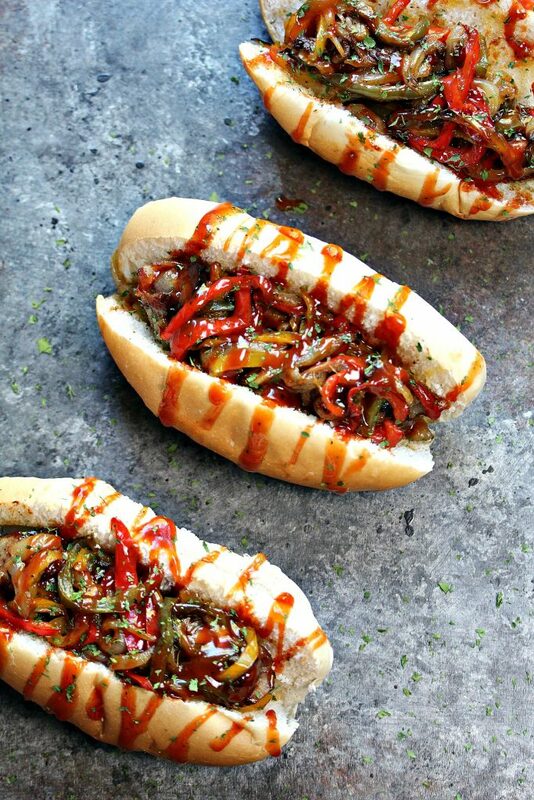 So we grilled up these delicious Grilled Bacon-Wrapped Beer Brats with Drunken Peppers and Onions! Let’s just say plates were licked the day we made these. Everyone loves this recipe. It’s one of the most requested recipes I make when company visits. We pile the toppings high and have at it! August 16 is National Bratwurst Day! 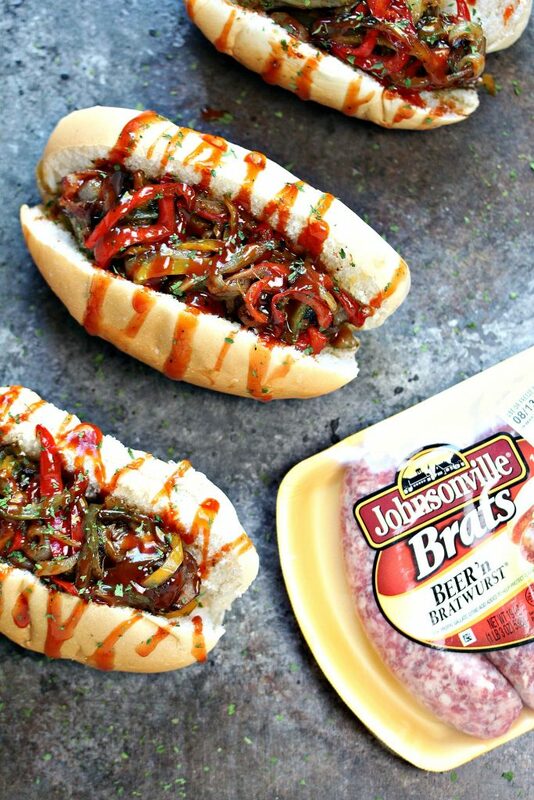 Johnsonville would like to invite you to celebrate Bratsgiving with them! To celebrate I made a short and snappy little video for you! Enjoy! Preheat grill to 375 degrees F.
Slice up all the vegetables and place in a 9 x 13 dish. Add beer and butter, and mix to combine. Sprinkle with salt and pepper to taste. Place on grill, put the lid down, and cook until vegetables soften. This takes about 20 to 25 minutes, depending on your grill. Adjust cooking time to your own taste. If you like the vegetables with some crispness to them you can reduce cooking time. If you like the vegetables very soft you can increase the cooking time. Remove vegetables, and set aside. Wrap all your beer brats with bacon. Use toothpicks to secure the bacon at each end. Place on grill and cook until the bacon crisps to your liking. This will take between 5 to 8 minutes for most grills. Adjust cooking time to your own taste. Remove from grill and brush the brats with half the barbecue sauce. Set aside the rest for drizzling on the brats before serving. Toast you buns on the grill for 1 to 2 minutes. I lightly butter mine first. Scoop some drunken vegetables into each bun, just enough to cover the bottom. 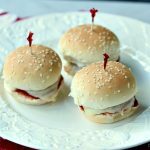 Place a bacon-wrapped brat in each bun. Cover with more drunken vegetables. Drizzle with remaining barbecue sauce. Toss some parsley over top of each one. Place on a platter and serve to your guests for Bratsgiving. Or any day. Serve with a big old Brat loving smile! 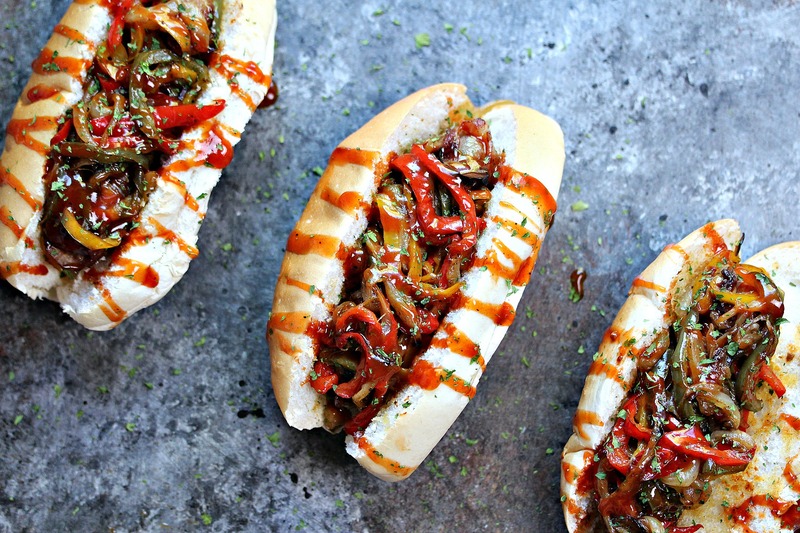 This recipe makes 10 Grilled Bacon-Wrapped Beer Brats with Drunken Peppers and Onions. If you allow 2 per person the recipe will serve 5 people. If you serve 1 per person the recipe will serve 10 people. Be sure to check out my recipe index for more grilling recipes. You can also swing by my grilling blog, Kiss My Smoke, for lots of amazing grill recipes. 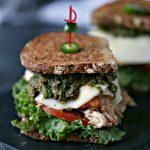 Follow me on Pinterest and Instagram to keep up to date on all the latest and greatest recipes from the blog. Every recipe gets shared on social media so it’s a great way to stay current on new recipes. Now that is some man food! Haha! That must be a flavor explosion! I’m obsessed with these, they look so good! Bratsgiving hahah I love it!! I love all the flavors going on here! WHOA!! This is totally being added to my grilling routine! I’m drooling over this for dinner tonight! I’m a huge fan of sausage too. I’ve always wanted to try a bacon wrap but I’m afraid of the grill really flaming up. After seeing your version, I’m just going to have to dive in because they look too good not to try! Ohhhh, these look positively scrumptious! I just loaded up on two 14-brat packages of Johnsonville brats at Costco yesterday. 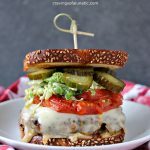 I have some grillin’ to do and this recipe looks like the perfect place to start! Bratsgiving, love it!! These look so amazing, I’m drooling right now! And I’m not even hungry, lol! Beautiful pictures. oh my goodness these look absolutely amazing!! I think we will have to try these this weekend. Totally drool worthy! These would make mu husband VERY happy! Gorgeous! this is looking absolutely scrumptious …what a great recipe Kim. I think my husband would propose to me all over again if I made him these. Love the way you think! We love brats all year long but especially in the summer for sandwiches like this. 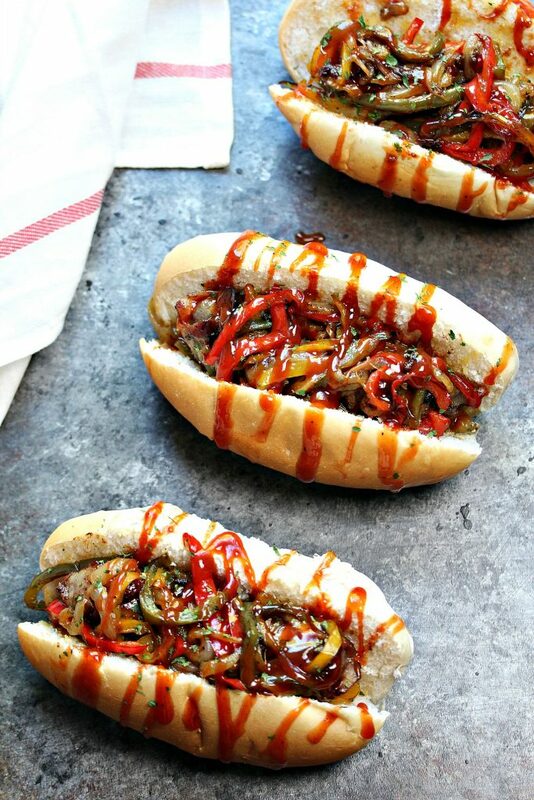 And those onions and peppers make these even better! 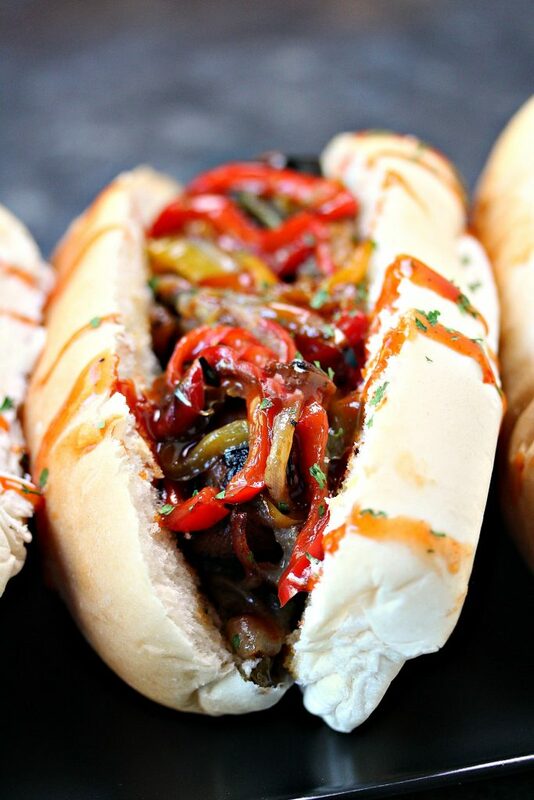 Beer brats are my favorite kind of brats – and that ridiculously delicious topping looks like the perfect complement. Pass me two! 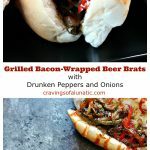 These beer brats are everything and the bacon with the drunken peppers and onions, Kim – these really are a must make! 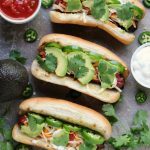 I adore this recipe – it’s perfect for tailgating as well! These are lovely! Bacon and onions! Yum! You’ve made these so yummy looking I can’t wait to make them. My hubby will be having a great day when he gets these for dinner! Love these Brats! Bacon wrapped anything is OK in my book. Great video too! 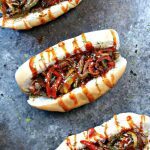 I love everything about these; from the juicy brats to the flavorful onions, this recipe is killer! There isn’t a single thing I’d change! These a perfect! 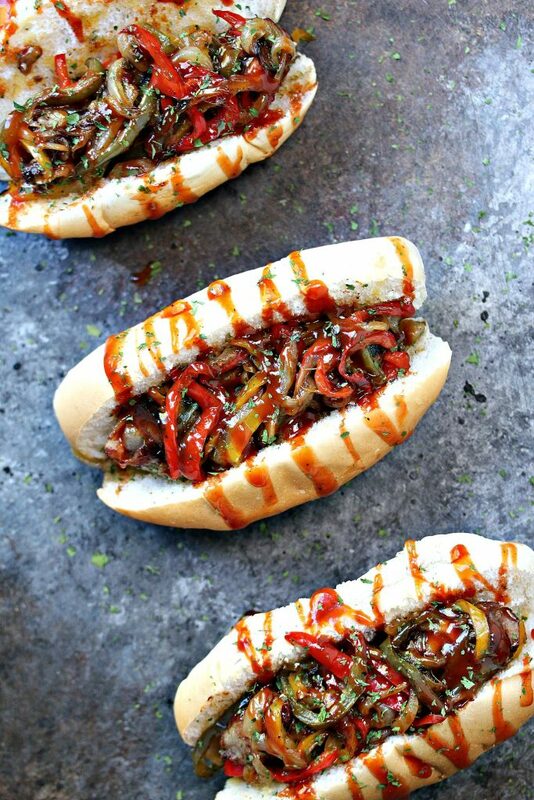 If I have to have peppers and onions I want those suckers to be drunk! Sounds like a lovely sandwich! Not only does this looks absolutely delicious but only you could make brats look gorgeous!! Oh my goodness, these look so amazing. I am hungry and I want one now.